I’m standing in front of the Lodge at Pebble Beach. Here for the Pebble Beach National Pro-Am. It’s Tuesday. Players, those who are here, have today and tomorrow for practice rounds. The tournament goes off on Thursday and will run through Sunday. I acquired a free ticket and decided to blow in, walk the course, watch some pros, and get out before monster spectator hordes overrun this $500-a-round golf course. The first hole at Pebble Beach is adjacent to the hotel and its row of genteel shops. Chris Berman is in the tee box shaking hands with everybody in hand-shaking range. Berman sports the day’s cool outfit: worn straw hat, faded Hawaiian shirt, khaki pants. I first saw him on a television screen in the break room of Construction Camp 1, Prudhoe Bay, Alaska. (Berman joined ESPN in 1979, a month after it launched.) Thirty-six years have passed and he remains the quintessential neutral character in my life. I don’t care about him one way or another. So, I thought, This might be interesting, follow a kind-of, sort-of famous sportscaster, someone I have zero interest in, know nothing about...follow him around the golf course, see what happens. The first hole is a 346-yard, par 4. Berman has one of the ugliest swings I’ve seen. It’s hurtful to watch. He hunches way over the ball, as if watching a spider on the sidewalk, then makes a kind of jerk-slap-lunge as he heaves club toward the dimpled sphere. It’s ugly, but he holed out with a respectable five. The second hole is par 5, 460 yards. Berman makes a mighty tee shot, the ball lands beyond the first bunker in the fairway. He works his way to the green, almost makes a long putt, missing the hole by a quarter-inch, finishes one over par at 6. Spectators close in as he walks between green and tee box, wanting autographs. Berman says, “How you guys doing?” “Where are you from?” A young girl holds out a calendar for him to sign. He’s always talking. Talks to players, caddies, their friends, autograph-seekers, himself, the big blue sky. More autographs, more photos. “Good seeing you.” “Here you go.” “Nice to see you.” “Thanks for coming out.” By the way, I don’t mean to sound like he has a gallery following him. Usually it’s six, eight people, and the number changes on the fly. It’s the 6th hole. “Ahhhhh, I skinned it,” Berman says to himself after a poor chip. Two small children run underneath the ropes onto the fairway wanting autographs. Berman stops, big smile, signs, asks after their names. Doesn’t seem possible, but he hits the ball consistently. This is the seventh hole, the par 3 that juts into the ocean, the one you’ve seen on television. Berman tees off, his ball lands on the green, looks to be a 12-foot putt. Hell of a shot. All the while he’s talking. Talking to his caddy, fellow players, himself. After he putts out fans move toward him. “Will you sign for me, Chris?” He stops, “How you doing?” and signs. A man waves from the lawn of one of the mansions lining the course. He’s holding an Anchor Steam. “Take it,” he says to Berman. “I want to give you back for last year.” Berman walks easy down the fairway with beer in hand, stops, partakes a long, slow swallow. A black-haired, purple-lipsticked, nose-pierced woman, maybe 40, arrives. “Anybody famous in this group?” I shrug, “Chris Berman.” Woman makes deer-in-headlight expression. “Anyone else?” “Well, Jason Day is one back.” Deer-in-headlight returns. Now the 18th hole; in fact, this is his last shot. Berman’s ball rests beside a tree off the green. He has to chip over a deep bunker. 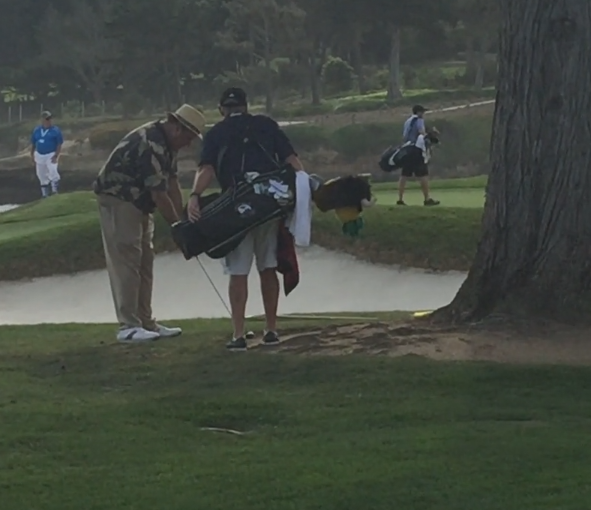 Berman confers with his caddy, quickly inserts/withdraws his right hand from pants pocket, addresses the ball with purpose, then throws a golf ball, the one he palmed from his pocket, onto the green. He turns toward the crowd, takes his hat off, opens his arms wide in Super Bowl victory pose, and accepts jubilant applause.